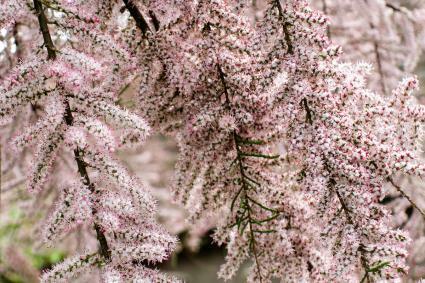 Tamarisk (Tamarix) is a graceful hardy shrub, also known as saltcedar and tamarix. Its distinct feathery pale pink flowers make this very invasive plant appear harmless. However, it is often blamed for altering wildlife habitats and increasing the number of wildfires. Before you set out to add Tamarisks to your landscaping, consider how invasive and, by many counts, harmful to wildlife and the environment it is. 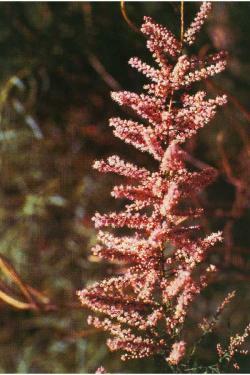 Tamarisk is both a shrub and a small tree, depending on species. While some species only grow 5 to 10 feet high (referenced as shrubs), others can grow up to 50 feet high (referenced as trees). Tamarisks are very deep-rooted, with roots growing up to 30 feet below ground, depending on the water table. Dense thickets of Tamarisk typically produce roots that grow 5 to 20 feet deep. Tamarisk is a threat to water tables since one big plant can consume 200 gallons of water per day. According to High Country News, that 73,000 gallons per year is often siphoned from a river. These shrubs/trees fuel fires at greater levels than normal brush fires. They show a remarkable growth rate with seeds and flowers after fires. 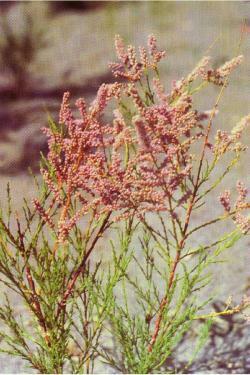 According to Global Invasive Species Database, the majority of species referred to as Tamarix ramosissima (t. ramosissima) actually represent a wide variety of Tamarisk (Tamarix) hybrids. All of them are invasive. 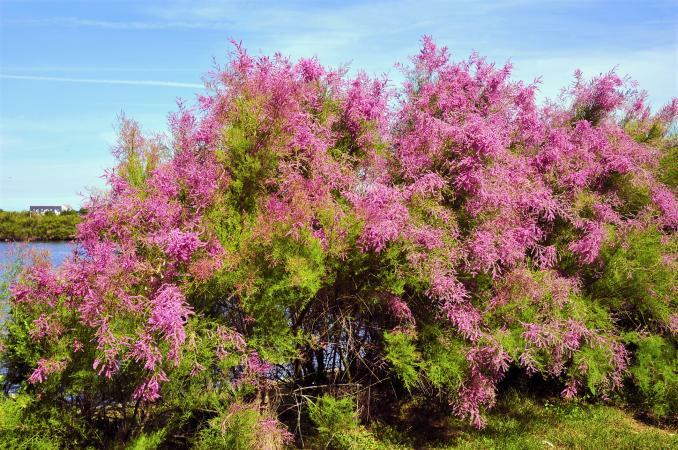 The Invasive Species Compendium reports, that recent DNA analyses make it doubtful that there are enough differences in the Tamarisk species to separate them. 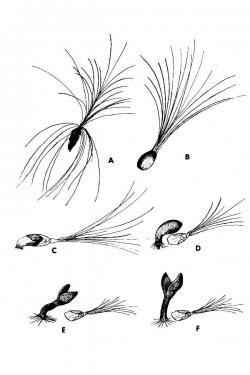 However, the report does state, "The current assumption is that the main invasive entity in North America is a hybrid of T. ramosissima with T. chinensis." Similar species found in North America include T. ramosissima (aka Saltcedar), T. chinensis, T. canariensis and sometimes, T. gallica is present. There are also some distinct T. parviflora and other various hybrids. Many methods have been used to attempt to control this highly invasive and destructive plant. Digging up the plants, spraying with herbicides and other various methods have failed to control the spreading of this plant across the United States. Montana State University scientists have developed a synthetic pheromone version of the northern tamarisk beetle pheromone to attract more tamarisk beetles. The Diorhabda elongata, or tamarisk leaf beetle seems to be the only pest that can harm, or even kill, a tamarisk shrub or tree. According to Alex Gaffke, one of the university researchers, the beetle pheromone affects the beetles the same way the aroma of bacon and pancakes does humans. In 2017, Arizona's attempt to eradicate the plant by introducing the tamarisk beetle had unforeseen consequences when the pest spread into California. Evolution and the survival of the fittest is a lesson in introducing this non-native plant in the Southwest. Between 1986 and 1992, the Coachella Valley Preserve, was able to reclaim 25 acres of wetland that had been overgrown with tamarisk shrubs and trees. Volunteers and crews from the California Conservation Corps cut the trunks with herbicides from hand-held and backpack sprayers. They had over a 90% success rate. You'll need patience if you wish to duplicate these results using Triclopyr (Garlon 3A and Garlon4). Mix one-part herbicide with three-parts water and spray immediately, as waiting decreases the success rate to 70%. Be sure to wear protective eyewear, long sleeves, gloves and other protective gear. Tamarisk does not have many enemies, a fact that allows it to grow aggressively. This highly resilient shrub/tree does have a few enemies. In addition to the tamarisk leaf beetle, two other insects - latania and oystershell scales - often infest tamarix. Spray tamarisk trees and shrubs with an insecticide in late spring to prevent infestation by these pests. A heavy infestation will require treatment in early spring by mixing a spray of concentrated sulfur and lime. Cankers are formed from three fungi - Botryosphaeria tamarici, Dipodia tamarascina and Leptosphaeria tamariscis. The cankers cause the branches to die and break off. The cure is to prune back to healthy wood and burn the prunings. Other fungi can cause various diseases, such as powdery mildew (Sphaerotheca humuli), root rot (Phymatotrichum omnivorum) and even wood rot (polyporus sulphureus). Tamarisk prefers saline soil and thrives near coastal areas, although the species can grow in almost any soil type, such as sandy, loam and clay. It prefers dry, well-drained soil, but can easily survive in moisture retaining clay soils. It cannot survive in the shade and needs abundant sunlight. As you can see, this plant is highly invasive and not recommended as an intentional planting. 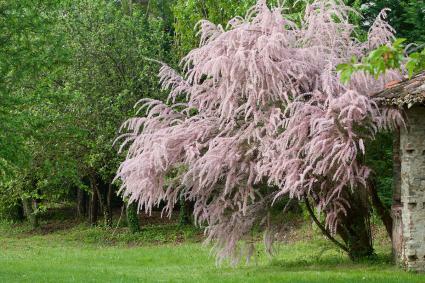 If you intend to plant tamarisk as part of your landscaping or for some other reason, keep in mind that it is not controllable and will overrun the area where you plant it. Tamarisk varieties grow in a wide range of hardiness zones from the colder Zone 2 to warmer Zones 10+. It prefers moist soil, so is often planted along coastal waterways. If you plant tamarisk, add a thick layering of mulch. Prune after blooms have stopped producing to boost the next blossoming season. Tamarisks easily grow from cuttings rooted or freshly cut thick branches rooted like a willow by sticking the cutting deeply into the soil. This plant is best propagated in December by cutting the fibrous green stems 6 to 8 inches long. You can place a cutting special soil for cuttings or create a mix of soils blended with river sand. Tamarix chinensis isn't quite so hardy as other varieties. It has very plumose branches and is a very graceful shrub tree with pink flowers on elongated branches. 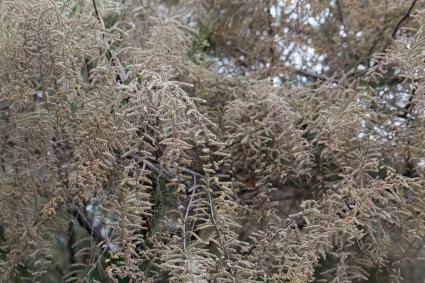 Saltcedar (Tamarix ramosissima) has gray-green leaves and pink or white flowers. The trees/shrubs can reach 15 to 20 feet high. The plant prefers saline waters, but is also found growing in wetlands, sandbars and around lakes. 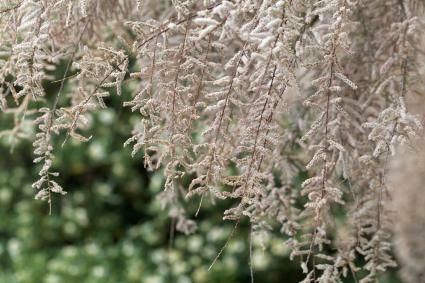 French tamarisk (Tamarix gallica) is found wild in France, North Africa and on the southwest coast of England. The shrub grows to 5 to 10 feet high. In North Africa, it grows 30 feet high or more. The flowers are pale pink and borne on short cylindrical spikes in summer. T. anglica is one form of this species and varies much in regions and reaches 13 to 19 feet high. Kashgar tamarix (Tamarix hispida) is from Central Asia. It has a distinct bluish-green foliage that flowers in autumn. A seedling form of this, aestivalis, differs widely again from the parent, since it grows taller and is more vigorous. It flowers from May to July. Tamarix odessana has soft grey-green foliage and handsome spikes of large rosy-white flowers. It is native to Southeast Europe and Asia Minor. This plant is found along rivers, lakes and streams/creeks. Tamarix tetrandra is similar to T. gallica in general appearance but is distinguished by four instead of five anthers. It is quite hardy, growing and flowering freely near London. The flowers are pinkish-white. Tamarisks are referenced in the Holy Bible several times. In the Bible, Genesis 21:33 recounts how Abraham plants a tamarisk shrub near Beersheba to memorialize the covenant he made with God. The shrub/tree was also where Saul held court and Saul's remains were buried under a tamarisk tree. According to The Telegraph, Tamarix gallica was the manna from heaven mentioned in the Bible. While wandering in the desert, the Israelites found the tamarix sap left by insects overnight on the ground as golden drops. Tamarisk shrubs create an ethereal beauty with their delicate foliage and sprays of soft pink flowers. However, their aggressive invasive nature should be a warning to those contemplating adding this plant as a landscaping feature.